We can always use additional monthly financial support. If you can help us with $25 or $50 per month we would deeply appreciate it! 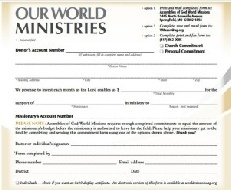 To do so, click on the form below, fill it out, and send it to us or our missions headquarters. You can also make a one-time or recurring credit card contribution to our ministry by clicking on the link below. You will then be redirected to a secure website at our missions head-quarters. 1. On Facebook, Twitter, or Google+, Use the links at the the top of this page or see the more detailed links on the About Us tab. 2. By e-mail. To get our “Prayer Update” about once a month, please send us your e-mail address to john.elliott@agmd.org. We want to express our heartfelt thanks to all you who are partnering with us and making our ministry in Zambia possible! 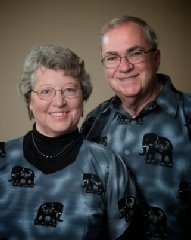 We are missionaries with the Assemblies of God, U.S.A. assigned to Zambia. John is focused on investing in Africa’s church leaders–a key component to the rapid expansion of the church on the continent! Dawn is concerned with helping illiterate adults learn how to read their Bibles. You can find out more about us, our ministry, and the land of Zambia under the tabs above. Contact details are under the “About Us” tab.